One thing every traveler wants from their villa is a view from every room…at Grand Large Villa, you get it! Enjoy scenes of the ocean from the pool deck, living area, and every bedroom. Soak in the sun on a hot day, then take a dip in the cool pool. Grand Large villa is a great getaway for couples, with plenty of privacy and amazing sunset views! Grand Large Villa is located on the hillside of Gouverneur in a quiet area near the beach and Gustavia. The villa is secluded, with sweeping ocean vistas that glow at sunset. Tucked into a manicured garden, the terrace features several exterior lounging spaces ideal for morning coffee or sunset cocktails. 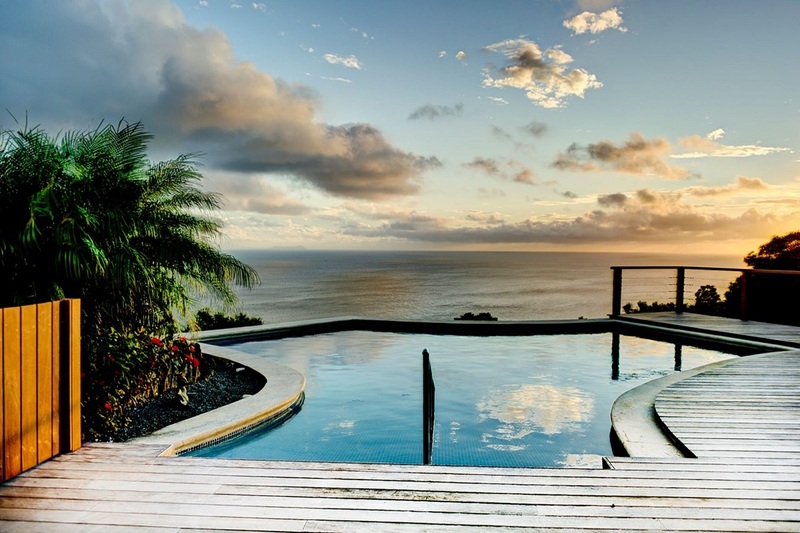 The uniquely shaped pool is framed in wooden decking, with an ocean view framed by tropical foliage. The covered terrace serves as an al fresco dining room steps away from the open-air living room which features an ocean view, plush furniture, and a TV. A few steps up, the dining table and breakfast bar leads into the gourmet kitchen. The kitchen is fully equipped with all appliances and cookware necessary for a feast. Each of the villa’s air-conditioned bedrooms is a master-sized suite with views of the ocean and direct access to the terrace. Close to being equal in size and amenities, the bedrooms are perfect for friends traveling together, and also for families as they all have interior access. Each bedroom has a king or European-sized king bed, a premium entertainment system, and a large ensuite bath. The king bedroom is slightly smaller then the other two bedrooms. Grand Large is a short drive from Gouverneur Beach, known for its serenity and white sand beaches. The villa is within walking distance to the famed Sante Fe restaurant, and several other dining options are within driving distance. A short drive to Gouverneur Beach. Welcome, age 8 and older.